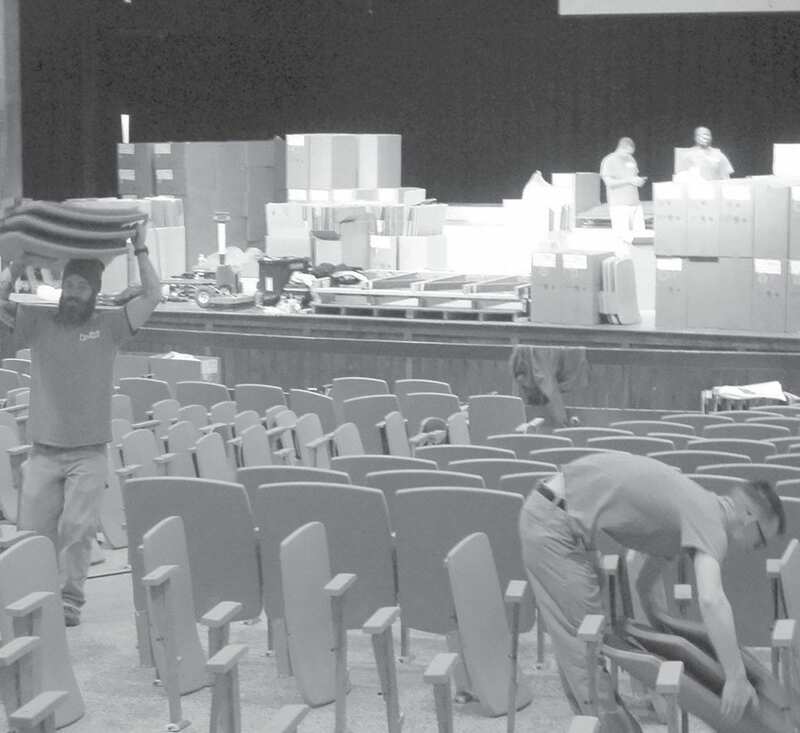 Workers were installing new seating in Eris Horton Auditorium this week, with carpet installation in the aisles to begin soon. The original tile flooring beneath the seats has already been replaced with a durable epoxy surface. Supplies for the remainder of the job are stockpiled onstage. Contract completion date is Jan. 21. Oneonta High School’s Eris Horton Auditorium is getting a major face lift – the first since the school was completed some 42 years ago. Installation crews have been working in recent weeks to remove the original seating and floor coverings that were showing the effects of four decades of wear and tear, and last week began installing new seating and seat-flooring area, with carpet installation in the aisles beginning this week. The due date for completion of the $215,305 upgrade project for the county’s most fully-equipped public auditorium is Jan. 21. When complete, the seating capacity will be 684. • replacing seats that were not usable due to lost or damaged cushioning, unrepairable seat mechanisms, torn upholstery, etc. “We have some further improvements to make, but we’ll hold off until this summer for those to avoid disrupting the use of the auditorium during the rest of the school year,” said Oneonta City Schools Superintendent Daniel Smith. He said the interior walls will be painted, along with the ceiling, if needed. In addition, the auditorium air conditioning system will be upgraded by replacement of parts which are nearing the end of their useful service life, he said.